Most people who learn to code typically encounter the same problem during their first few months. They’ll read a book or two and learn the basics of a programming language. They’ll write a few short programs. They’ll figure out how to print “Hello World” to the screen, and then they’ll figure out how for-loops work. And then they’ll hit a brick wall, and struggle to figure out where to go from there. At this point, I typically recommend that the person reads some open-source code on GitHub, checks out Project Euler, and the Daily Programmer subreddit. But going forward, I’m going to add CodeMade.io to my list of recommendations. Here’s why. CodeMade is a user-generated collection of (mostly) physical computing products, complete with links to their source code. Projects are grouped by category, and range from basic Arduino projects that anyone can grasp, to more sophisticated ones that use artificial intelligence and deep learning. This makes it trivially easy for a beginner to find a cool project and start building. 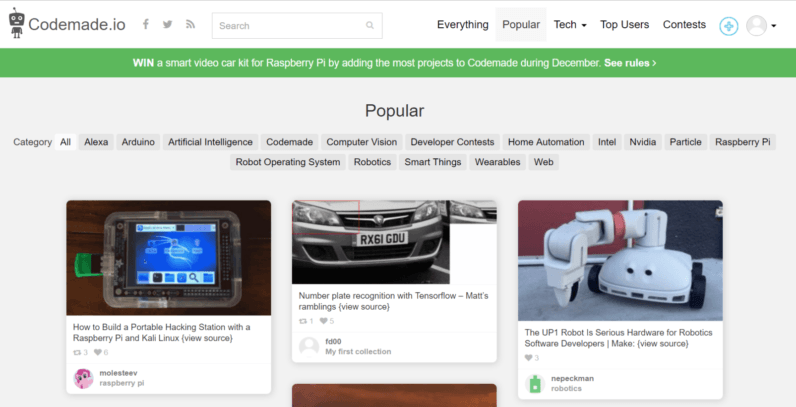 These projects are sourced from a variety of sources (GitHub, Instructables, Make Magazine, LifeHacker), and are aggregated into collections. I suppose you can think of it as being a bit like Pinterest, but for nerds. It’s early days for CodeMade, and while the collection of available projects is relatively limited, the site’s got a small but expanding community. I’m cautiously optimistic that it has the potential to become a must-visit for journeyman programmers on their way to Internet of Things greatness. You can check it out here.